Last edited by semperfifishing; 04-02-2017 at 03:43 PM. Visit Capt. John Deering's homepage! I am desperately wishing one of those was mine. Unfortunately, I don't trust my dogs around the kids. It has lead to them not nearly getting the attention they need and they go in the pen when the kids are out playing. I hate it has to be that way but my kids come about 100,000 miles before the dogs. When my oldest was 2 our female dog snapped at her barely missing her face. My wife didn't tell me for a week and my daughter has a pretty irrational fear of dogs now, age 6. Had I seen it I would have killed her on the spot. I had a friend that was bitten on the face by a dog when she was a child, she had a pretty horrible scar and has a host of self image issues because of it. Every one gets their tht pitchforks out I see a pit licking a baby's face. Love it. My GSHP slept next to my bed for four years until the day my son was born then for the next ten years slept in front of the crib or at the foot of his bed. That dog was something special. Not all dogs have a temperament for kids, but it was amazing to see how our cur and American bull behaved when we brought our son home. They didn't want to lay with the baby but became extremely protective and would instantly jump on pretty much anything that came close to him. Right on. Get upset and of course you will but anyone who would put an infant or a small child's face next to a dog is just plain stupid. I heard Nick Saban already signed that kid with the Sharpei to play left tackle. Something special about kids with their dogs. And I is no less special when the kids grow up. Last edited by On The Edge 1; 04-03-2017 at 08:14 AM. He wasn't licking the baby's face, he was sampling for temperature before he bit into it. My boys love their dogs! I trust dogs more than people. Yet most leave them to babysitters they hardly know. Of course some dogs don't have tolerance for kids and some kids are abusive to dogs but not the norm. Most children will be injured by a sibling, sports, vehicles or a trusted adult yet photos with them never draw stupid comments. Sad days losing those two. Our new one. 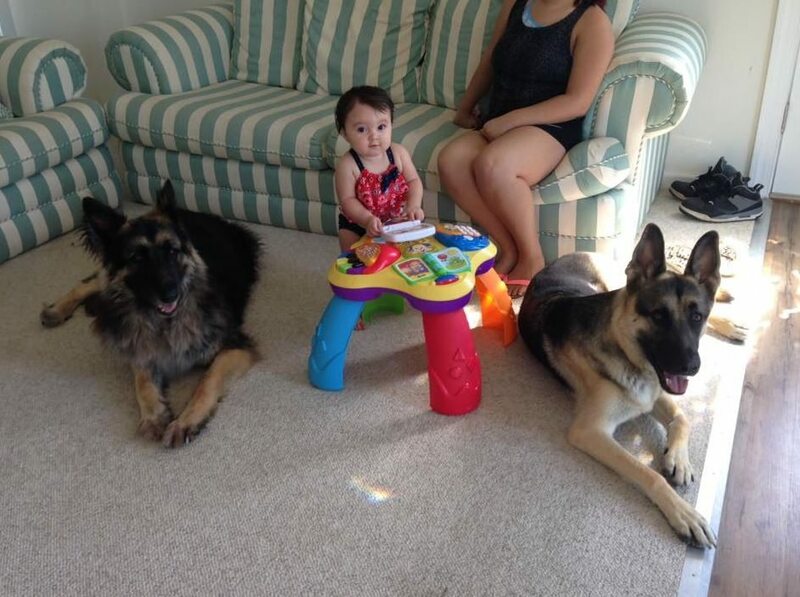 I'd say this baby is pretty well protected... Good luck trying anything.